From the right angle, it really looks like an Audi key doesn't it? The mysterious obelisk known only as "the Talisman" is an object of great power and even greater mystery. Its vast power ties it to Prysmos, Cybertron, the Dire Wraiths and Microspace. According to Merklynn, it is an object of great mystical power, and has shown to be destructive to Transformers. However, it has also been responsible for technological advancements of the IRON Troopers and the temporal displacement of Sgt. Savage. Befitting any artifact of cosmic power, it is sought after by a myriad of international criminals. Nonetheless Kreiger was allowed to study the device under government supervision. When Eagles Scream Atomic Man approached Kreiger about his constant desire to improve himself via Talisman technology. Eventually however, Power had replaced so much of his body with Talisman technology that he declared himself "the Talisman made flesh". Power and Glory In 1994, Kreiger had Power make contact with the Talisman which had the unexpected effect of pulling Sgt. Savage and the Axalon from the timestream. After being stabbed through the chest by Storm Shadow, Blackrock's mind was transported to the realm of infraspace where he encountered Onyx Prime who revealed that the Talisman was inoculation against a coming threat...a threat Blackrock would not be around to see. The spectre of Mike Power saved Blackrock from the Prime before the two returned to the living plane leaving an enraged Onyx Prime behind. In the material world, Blackrock used his connection to the Talisman and Storm Shadow's Human/Wraith DNA to engineer a curative pulse to counter the effects of the earlier mutagenic wave. Summoning Metrotitan, he was able to transmit the cure on a wide scale via the Titan's Spacebridge. The curative wave had the unexpected side effect of releasing the consciousness of Mike Power into Centurion, creating a composite being. Remember the easy days when all weird, alien devices were instantly dismissed as being Quintesson in origin? Despite its ostensibly magical nature, the Talisman has been the source for several character with cybernetic enhancements. Mike Power, Storm Shadow and her Red Shadows, and Joe Colton/Baron Ironblood all have cybernetics derived from the Talisman, or Talisman-based technology. Considering the alliance between characters like Kreiger and Miles Mayhem, it's possible that Bruno Sheppard's cybernetics may also be Talisman-derived. 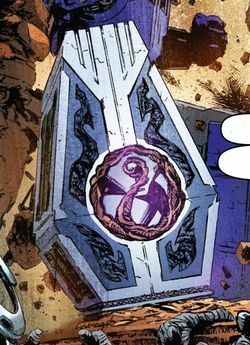 Considering the false Ironhide's head can be seen in Revolutionaries #3 outside the Tomb of Amtoltec, it is possible he was the one who brought the Talisman to the Tomb. The final story arc of the original Visionaries comic book featured the Spectral Knights and Darkling Lords competing to secure four objects called "talismans." These talismans were small jewels and bear no resemblance to the IDW artifact, but we'd be remiss not to tell you. Optimus Prime #10 features the Talisman cameoing among "Onyx Prime's" possessions. Later revelations about the artifact would turn this into an error. This page was last edited on 27 November 2018, at 16:13.